[he Hon'ble The Political Resident A senior ranking political representative (equivalent to a Consul General) from the diplomatic corps of the Government of India or one of its subordinate provincial governments, in charge of a Political Residency. 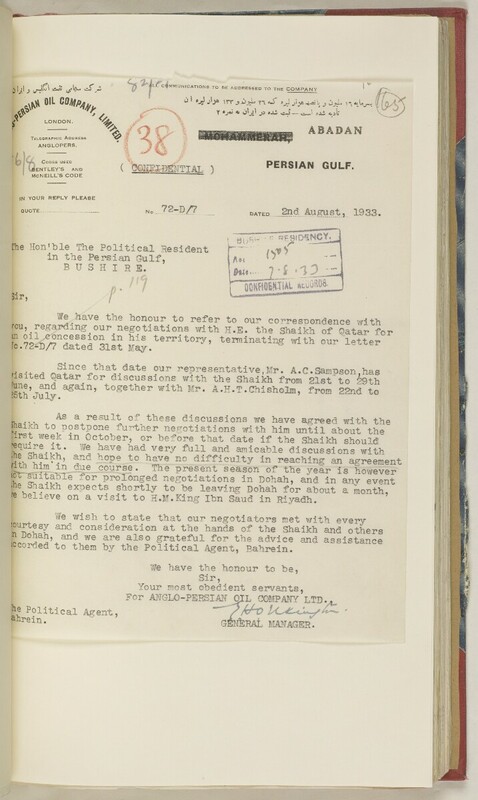 B U S H I R S.
6 relieve on a visit to H.M.King Ibn Saud in Riyadh. iccoroed to them by the Political Agent A mid-ranking political representative (equivalent to a Consul) from the diplomatic corps of the Government of India or one of its subordinate provincial governments, in charge of a Political Agency. , Bahrein. For MGLO-PERSIAN OIL COMPANY LTD.